Who are you suppose to tell if the people you would usually report these things to are the ones committing the crime? I get there needs to be things that not everyone needs to know for a variety of reasons but there is a point in time where everything should slam up against a giant redundancy wall in our government. In all of these cases it did not, and lets not forget how many there were! So this wasn't some simple clerical error. The wall wasn't there and so Bradley stepped in. What in the world would you do if you had to see all these horrible things happening to these people every day for years and no one was doing anything about it. Do you really think you could just set there and shrug it off because this time it happened to be coming from your own country? No one does anything perfectly but... if nothing else you should recognize the bravery and patriotism it takes to do all that he has done. "I don't need your sweet emotion, or your 'little Bo Peep' devotion, all I want is just a portion of your dirty love..."
This is probably a file photo, that and he doesn't get his new threads until he gets to his new home. You are scred up and need to see a shrik"
my sentence calculator says that is one day for every 58 pages of leak. is it a good thing or a bad thing? The fact that Pfc. 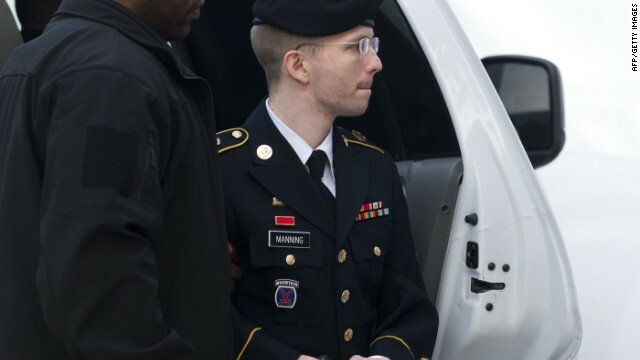 Bradley Manning was convicted at all is a total ignominy!!! Yes, there are men in the military who got off with extremely light sentences while others went scott free for abusing or assaulting their female counterparts is totally ludicrous. Then again, there are those filthy creeps who operate those ungodly drones, slaughtering people in Afghanistan, Pakistan and Yemen on a daily basis. Where is the justice??????? Will somebody tell me, please? who is looking for justice? not me. and FYI – people operating drones are not creeps, they are just doing their job. People who're fighting our forces in Afghanistan, Pakistan, and Yemen are creeps or illiterate muslims. Come on George Patton-2.01, you're beginning to sound like Tea Partier for taking up for those murdering cowards who operate those monster drones. Have you any notion of what it's like to be on the receiving end of one of those 500 lb. bombs? Evidently not!!! The only good thing about this sentence is chances are he will get shanked and never walk out. Just goes to show how America is becoming cowards.